Everyone wants a fit, good-looking body – but wanting it and actually getting there are two entirely different matters. Unfortunately, like most things in life, building body strength and muscle tone take a good amount of hard work and dedication. Rowing machines, in particular, are useful for full body exercise and burning calories in this way, but a decent one will set you back hundreds or even thousands of dollars. Buying a used row machine is a cheap, money saving option, but you have to weigh the lower price up against another consideration: how the machine functions. In other words, it’s certainly well and good that you’re getting a cheap (or at least, cheaper) machine, but what you pay for is generally what you get – all the parts will be there but, in some cases, price-dependent, you’ll sacrifice some of the new, higher-end technology. When you buy a used row machine, particularly online, make sure the thing you end up buying actually fits your needs and seek expert advice if you can before putting the cash down. After all, you’re buying a rowing machine to lose weight, and if it doesn’t meet that requirement, you’re wasting your time. There are a couple of advantages to buying a used rowing machine, primarily that there’s always going to be supply. 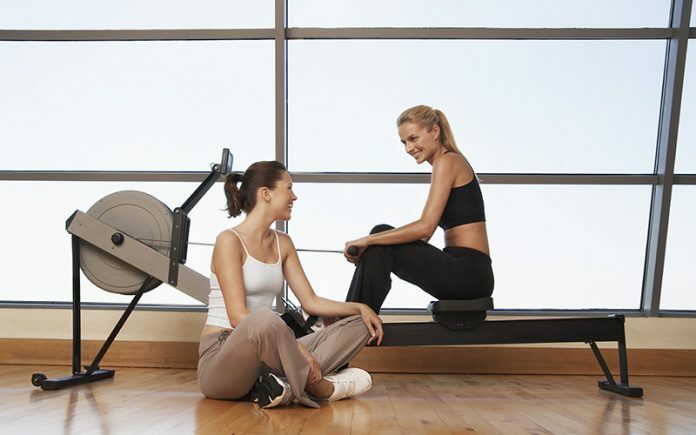 You know how it works: people buy a rowing machine; full of good intentions. But they use it to lose weight for a week or two , get fed up with the whole exercise thing, and eventually give up on their goal of becoming fit. Then they chuck it on the internet in the interests of creating valuable space in their home. That means often people are selling branded machines at less than the recommended retail price – not to mention, you’re doing the seller something of a favor. That must feel nice. I imagine. Speaking of price, when it comes to second-hand machines like this, money is less of an object. Following on from earlier, economics dictates that when it comes to jacking up the supply of such machines, the torrent of cheap machines will outstrip demand, and so prices – the money you have to put out for your exercise machine – come down. That means, when it comes to buying used rowing machines, your wallet ultimately takes less of a hit than if you had bought a brand name item first hand. With all that being said, the second-hand goods market can be a wild place, particularly online. So, it’s worth making sure you do your due diligence. Before taking the plunge and buying used rowing machine, make sure you do the legwork – after all, if you buy something that doesn’t meet your needs, you end up with a piece of metal junk in the corner of your room. Let’s be fair, you’ll end up throwing on the world wide web and making a loss on. The internet, that font of all human knowledge, is your friend. Before handing any money over to anyone, check that the machine you’re interested in matches up with your exercise requirements so that the hard work you end up putting into it will deliver that fit, toned body you’re trying to achieve. You can also buy second-hand machines off of the internet, but here you should crank up the caution meter considerably. Online, anyone can be anything, so make sure to keep your eyes open while searching around – check and recheck the reviews for both the machine you’re interested in and the seller themselves if possible – eBay has a seller reputation system that allows people to vote down sellers that give poor service – make sure there are plenty of photographs on the sales page, and absolutely make sure that you’re buying the item through a trusted online reseller like eBay or Amazon. Also worth taking into consideration, whether you’re buying the used rowing machine of your dreams online or off, is whether the seller is willing to either refund your money or replace your machine if your equipment ends up not working. If not, it might be advisable to look elsewhere. When buying something like this, the identity of the original manufacturer is important: if you can, try to get something with a recognizable brand, and avoid purchasing ex-gym equipment. Rowing machines built by top brands were designed to last, and if their parts have been maintained well, even if you buy the equipment second hand, you’re still probably looking at a good few years worth of exercise. On the subject of parts, one of the other advantages inherent in making sure you buy products from reputable manufacturers means there’s almost always an office somewhere that can replace parts and equipment that suffer damage over time. Get the contact information for the manufacturer if you can. Even though the machine’s lower than industry standard price may be tantalizing, when in doubt, you should always seek information from an expert before purchasing any home gym equipment online or off. Gym staff will usually be able to assist you; describe the model of rowing machine you’re interested in, ideally with pictures if you have them, and they should be able to advise you on whether, in their opinion, the purchase is worth your money. The gold standard for this sort of thing is actually getting a demo of the used row machine in real life. If you are able, visit the seller in person and take the machine for a spin yourself; this will help you get an idea of a) the machine’s condition and b) whether the equipment is actually something that fits your needs and which you could see yourself using in the long term. While visiting with the seller, check all of the relevant parts, investigate if the machine has suffered any obvious or less obvious damage – observation is key to making sure you don’t get ripped off. This is, of course, all much easier if you’re making the buy in person, but if not or if you’re not able to travel to the seller to view the machine in action, there are other ways you can verify the equipment works. Make sure to request photos and videos of the machine in action (and ensure they include some way of confirming the date of the photo or video in question to make sure they aren’t sending you things they’ve just pulled from the internet) as well as have them vouch for the good condition of the various machine parts – again, extracting a promise of replacement or refund in the event of anything going wrong is a good bet and a sign that the seller is for real. Make sure to carefully scrutinise any photos or videos that you receive, and do not be influenced by them if they’re put together professionally – scammers can look professional, too. In a similar vein, make sure you find out the machine’s medical history, so to speak, if you can’t examine the parts in person yourself: how old is the machine, or, at least, how long has the machine been in its current owner’s care? Has the machine undergone any repair work in the past eight to twelve months? Did the owner replace any of the original parts of the machine? How often has the machine undergone maintenance? These are all important questions to find out the answer to so you can gather a more direct idea of the machine’s condition and make a more informed consideration as to whether to part with any of your money: don’t let up until you have all of the salient details you need to make a smart decision. Reputable sellers will be happy to take any and all of the questions you pose; if they start getting sketchy or push you towards making a deal, it’s altogether likely what they’re trying to sell you is of manifestly poor quality. Don’t let anyone sucker you in. In all of this, remember the important, salient point to take away: up until the money changes hands, you can always walk away. If you don’t think buying a particular used row machine or indeed anything you buy in your day-to-day life suits your needs, or if you aren’t convinced by the seller, or if something just doesn’t seem right, you can drop everything. Using up someone’s time by exercising caution about a product doesn’t mean you subsequently owe them a purchase – caveat emptor, et cetera. But say you’ve gone through this whole process and you’ve found a used row machine that you’re ready to invest in – you can see the magazines with your fit, muscular body on the cover already – and you’re ready to make the purchase. Before you do, there’s one more task: recheck, recheck, recheck, re-check. Make sure the brand of machine you’re buying is reputable. Make sure the reviews of the product are good, and that the seller’s reputation, if available, is positive. Make sure that if you haven’t had a chance to actually go down to the seller in person and done some detective work yourself, the machine looks to be in good condition based on the photographs and videos the seller has supplied and the second-hand machine suffers no signs of visible damage. Make sure you’ve questioned the seller themselves extensively to make sure that the machine is in good condition and you have a handle on the machine’s repair history and whether the owner has done a replace job on any of its parts. Ideally, make sure you’ve extracted a promise that the seller will refund your money or replace your equipment if it doesn’t function entirely to your specifications. Lastly, make absolutely sure that this purchase is something you yourself definitely want to do. Remember the point of buying a used row machine in the first place: to lose weight. If you don’t think you’re going to get the exercise out of it you need to get fit, then seek the advice of an expert or simply walk away. In short, buying a used row machine can be a seamless, streamlined process if done right, and the advantages thereof can be extensive: supplying years of good exercise and a fit body at the end of the whole experience at a lower price than you would otherwise find on the market. It can also be a terrific headache if done wrong. Online sellers can hawk off inferior equipment to naïve buyers – make sure you aren’t one of them. Oh, and don’t be the guy who buys the used rowing machine, promises they’re totally going to use it for a while, uses it for a week, and then sells it off again when they get inevitably frustrated at the lack of immediate results. The internet thanks you for your service. Previous articleDIY Ideas to Create the Lawn of Your Dreams!